Lowepro launches its newest DSLR camera bag – a multi-device carrying solution with an innovative UltraFlex fit system for city and travel: the Transit AW series. In addition, the company unveils its new and sporty camera shoulder bags designed to offer photography enthusiasts a versatile, lightweight solution for a DSLR or mirrorless/CSC kit: the Photo Sport Shoulder series. The Transit AW series is built for speed, multiple devices and flexibility – the essential features shooters need to get the perfect shots and easily move from location to location. The fast-opening side access allows a photographer to grab a camera via the zippered compartment when the pack or sling is rotated from back to front. A multi-device interior offers dedicated and protective spaces for camera with attached lens, extra lenses, a flash and accessories, plus a separate and padded compartment for a laptop (in the backpack) or tablet (in the sling). 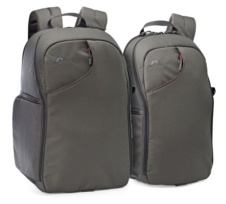 "We incorporated the best access and protective features of our top-selling, urban DSLR backpack and DSLR sling designs – then added a versatile UltraFlex fit system to give photographers choices on how they pack and organize a wide variety of camera and personal gear," said Tim Grimmer, worldwide director of product management and design. "The result is a lightweight and ergonomic design that lets you configure your set-up in multiple ways and helps get you to your destinations with ease." Lowepro's innovative UltraFlex fit system provides versatile ways to fit, organize and protect camera and personal gear via the central flex divider, lens cradle and smaller dividers – all padded and constructed with hook/loop fasteners for easy adjustments. The lens cradle may be used to support a long lens when it's placed vertically in the main compartment. The Transit AW series also features: a built-in All Weather AW Cover to protect gear from the elements; a Hideaway Tripod Mount to secure a compact tripod or monopod to the side of the pack or sling; ergonomic straps to help evenly distribute weight for a comfortable carry; and a stow-away, stabilizing waist strap to offer extra security when on the move. The Transit Backpack 350 AW fits a Pro DSLR with attached lens (up to 70-200mm for side access, or 300mm when stored vertically); 1-2 extra lenses; flash and accessories; compact tripod; and a 15" laptop. The Transit Sling 250 AW fits a DSLR with attached lens (up to 24-700mm for side access, or 70-200mm when stored vertically) or a mirrorless/CSC kit; 1-2 extra lenses; flash and accessories; compact tripod; and a 10" tablet. The Photo Sport Shoulder is built to accommodate a wide variety of camera and personal gear. The customizable and removable camera insert provides padded protection and a versatile divider system that adjusts to fit a DSLR or a mirrorless/CSC kit – making it easy to change up gear depending on the day's shooting plans. The insert is also adjustable within the shoulder bag: hook/loop attachments at the base allow you to position your camera gear at the front, middle or back of bag – depending on where you want to carry the equipment weight. "Our new Photo Sport Shoulder takes its inspiration from our award-winning Photo Sport designs," said Grimmer. "To make this travel-friendly shoulder bag a 'sport,' we added durable ripstop nylon for lightweight resiliency, thick webbing straps for a comfortable and secure fit on the body, plus a storm-flap closure for extra moisture protection around the camera box. With this design, photographers have the flexibility to use this as a DSLR bag, mirrorless/CSC bag, or to carry a day's worth of personal items." To create even more flexibility for photo enthusiasts, travelers and daytrippers, the camera insert in the Photo Sport Shoulder may be securely cinched with a storm-flap closure, lifted out via grab handles, and put in a safe place while the shoulder bag is converted to a fully functional day bag. Multiple storage options provide plentiful space for all types of items. The roomy interior fits lunch, a light jacket, a tablet with its protective cover, sunglasses and other essentials. Two exterior zippered pockets are the perfect places to stash a smartphone, lens cap, wallet, keys or lip balm. An interior zippered mesh pocket holds spare batteries, memory cards and cables. Lastly, a quick-grab outer pocket fits a water bottle to keep hydration within easy reach. 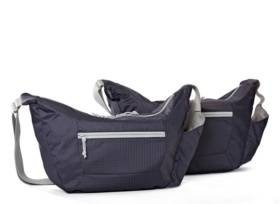 The Photo Sport Shoulder is available in a 12L and 18L size and features a purple and grey color combination.